The combo pack. 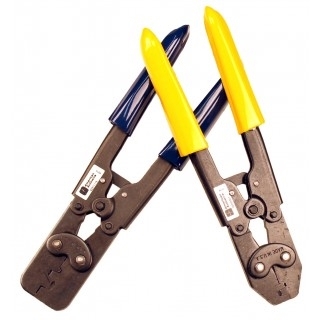 Single crimper used for F-type terminals included in Classic Update and universal harnesses. Wire sizes ranging from 20 gauge to 14 gauge and Double crimper Used for F-type terminals included in Classic Update and universal harnesses. Wire sizes ranging from 10 gauge to 18 gauge, or terminals requiring a two wire connection.